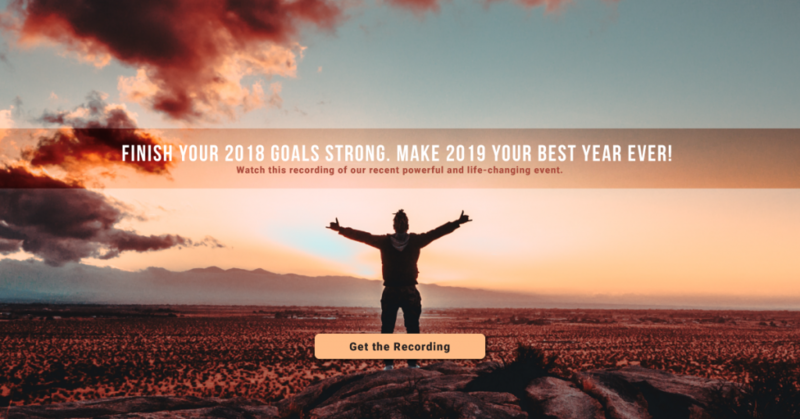 We’d like to take this opportunity to thank everyone who joined us for our webinar “Finish 2018 Strong & Set the Stage for 2019 (Make It Your Best Year Ever)”. The webinar was a huge success and we hope you’re now using the techniques highlighted to improve your own life. If you missed the webinar and would like to review the presentation, please click here to begin. In this post, we’ll present a quick overview of some of the concepts showcased. This recorded link is only available for a limited time, so access it now before we remove it. Removing negative thought patterns can help you to focus on the positive elements in your life. But it’s important for you to take the tangible first step in this process. The Delete Delete Technique can be used to control negative thought patterns. Each time you remember an embarrassing moment, or you begin to doubt yourself, remember to repeat “delete delete” to regain your control and focus. Without understanding the source behind the negative emotion, it can be difficult to place yourself back on a positive track for the long-term. Consider where your negative thoughts come from, and pinpoint the moment you begin to think negatively. This can help you to rewire your neurons to achieve a more positive mindset in future. Progress should be the goal for improving your mindset. Try to take tangible steps each day to improve your mindset and your lifestyle and forgive yourself for not meeting your high expectations. By doing so, you give yourself room to improve over time and ensure that the next steps become clearer with each action taken. Our experienced life coaching team can help place you on the right path moving forward. To learn more about our services, and how we can help you to achieve your goals for 2019, call today for a consultation.